Male golden jackal is the only animal known to babysit regularly. The original mix was between a reindeer herding spitz called a Lapinporokoira and a golden jackal from Turkmenistan. Other breeds of domestic dog have been added, but these dogs have a very strong jackalish and herding spitz appearance. The original dogs were kept at 3/4 Lapinporokoira and 1/4 golden jackal. The jackals were chosen to produce this dog because the jackals are known to have a better sense of smell than domestic dogs. If your diet is carrion and you don’t live with messy humans, you need a very strong sense of smell to find food. Klim Sulimov decided to create a golden jackal hybrid to make a super sniffer dog. I would love to see how these dogs compare to more conventional breeds. Now, as I have said before, golden jackals can interbreed with domestic dogs. However, domestic dogs and golden jackals have to be raised together before they consider each other mates. Jackal-dogs really aren’t that common, although it suspected that the wolfish golden jackal from Egypt may have some dog in it. The jackal is a member of the genus Canis. There are three species of jackal including the Canis aureus, the golden jackal which is mainly found in central Africa through the middle east and into Russia. 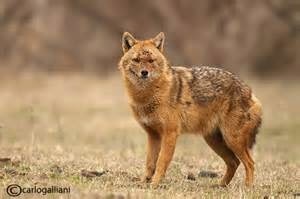 The golden jackal has yellowish gray fur which is dark on top and lighter underneath. Research has begun to point toward this animal as the predecessor to some of our modern day domestic breeds. Canis adjustus, the side striped jackal, which can be recognized by its two yellow brown stripes that run lengthwise down its flanks. This jackal, residing in Africa, is one of the many prey of the leopard. The Canis mesomelas, the black backed jackal, can be found in eastern and southern Africa. This species has a thick dark saddle of fur across its back. This jackal is by far the most aggressive of the three species, even daring at times to raid settlements at night, killing flocks of chickens. Jackals tend to look like a cross between a wolf and a fox. Their bodies are usually about 30 inches long and their tails about 1/3 their body length at 10 to 12 inches long. They live partly on young birds small mammals, fruit and insects. They are, however, most well known for feeding on carrion, the remains of kills made by other animals. Along with the hyenas, African jackals often follow the lions, finishing off the carcasses of the kills they make. Jackals also find carrion by following the vultures, another carrion-eating animal. When the vultures stop circling in the air and swoop to the ground, the jackal races to that spot, knowing the vulture has found food. Many times, a large enough group of vultures, hyenas and jackals can run off a lion, leaving its kill behind to the scavengers.